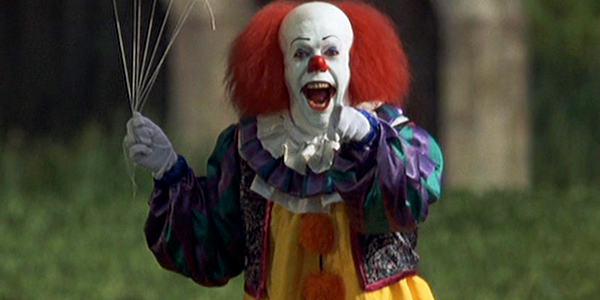 The most popular story I ever posted on Ear of Newt was the interview I did with Tim Curry on the set of Stephen King’s It, when it was filming in my stomping grounds of Vancouver in the summer of 1990. On assignment for New York-based horror mag Fangoria, I got to chill with Curry at Stanley Park while he was in full clown makeup for his portrayal of the murderous Pennywise the Dancing Clown. I was the only journalist in the world given that opportunity, as far as I know. Fango pulled a lotta weight in them days, I suppose. Interest in the Pennywise character, and It in general, seems to be ramping up, no doubt because of a new two-part adaptation, the first of which comes out in September. It’s being directed by Andrés Muschietti, who also helmed the supernatural horror flick Mama, which I thought sucked. Young actor Bill Skarsgård plays Pennywise, and he’d better bring his A game if he hopes to match Tim Curry’s performance. A year ago I posted an audio excerpt from my interview with Curry in which he outlined the motivating forces behind Pennywise’s evil ways, describing him as “a smile gone bad”. In this newly digitized snippet from that trusty old cassette I’ve had lying around for 27 years, he talks a bit about the actual clown makeup itself. At around the 1:15 mark makeup-FX supervisor Bart Mixon gets his two-bits in about the process, but you can barely hear him because he was standing behind Curry, too far from the tape recorder. But after about 15 seconds Curry takes over again, explaining that Pennywise’s eyebrows were the hardest thing to nail down.